I liked this post form Panfilocastaldi so much that I am re-blogging it. (At least I think I am, not having tried this before). Watch out especially for the Yanko Tsvetkov maps. Hope you enjoy it as much as I did. During Season 2 of Aaron Sorkin’s heroic television show, The West Wing, a nerdy but quietly zealous group called the Organisation of Cartographers for Social Equality introduce the Whitehouse staff to the Peters World Map, an equal-area map where 1 square centimetre of map equals the same number of square kilometres anywhere in the world. 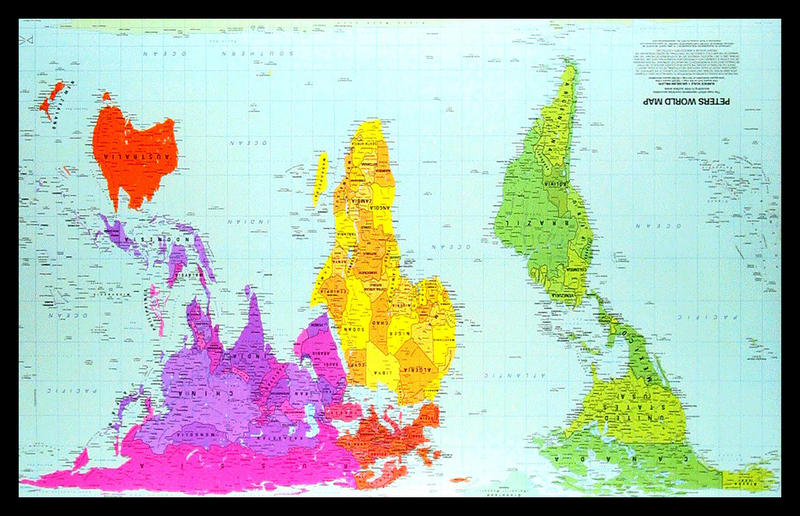 Despite this map being proportionately accurate, the staff are shocked by the inconsistencies between it and the more familiar, but deliberately distorted, Mercator projection. Invented in 1569 to rationalise the lines of nautical travel, the Mercator map shows Australia to be roughly the same size as Greenland, despite it in fact being more than three and a half times larger.